Cate is in her late thirties and lives in Sheffield, England. Follow Cate on Twitter! 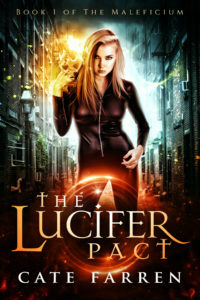 Cate is the author of The Lucifer Pact. When Ronnie Campbell was nine years old she made a pact with Lucifer to bring her parents back to life. He will return to collect what is owed him when she turns twenty-five. Years pass. Ronnie is now a teacher for young witches, secretly training for the day Lucifer comes back. She’s prepared to fight him with every magic spell she has in her repertoire. But there are complications. A secret group called The Maleficium have become interested in her, and they will stop at nothing to get what they want, including sending assassins after her family. Can Ronnie stop Lucifer claiming her soul and the Maleficium from destroying her family or is she doomed to failure?